The importance of Sunday night’s 6-5 win over the Pirates can’t be overstated. As we sit here in the middle of May, that may seem like a hyperbolic statement because for all intents and purposes, this season in still quite young. Baseball skeptics will tell you there’s still more than 100 games left to play so there’s no reason to get worked up over one game in May. 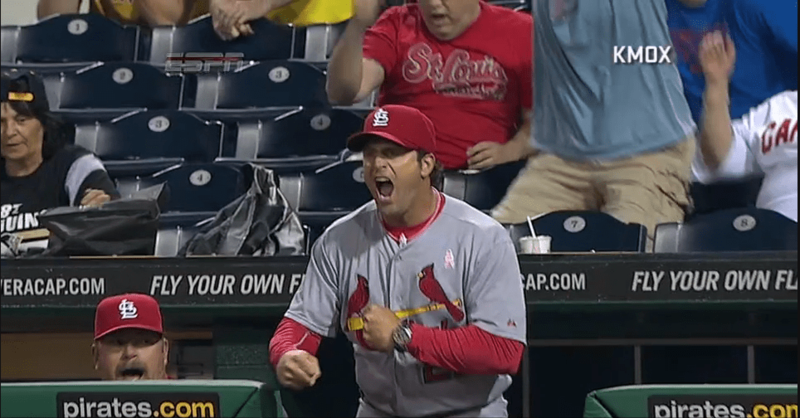 But those of us who have watched this 2014 Cardinals team struggle in just about ever fashion, all of us probably had a similar reaction to that of Mike Matheny and Matt Adams. That was days, weeks, really even a month of frustration being let out after a pretty crucial win. The Cardinals finally got some timely hitting Sunday night, then even added some insurance runs late, both of which have been extremely rare occurrences for a club that had an embarrassment of riches of both last season. Shelby Miller wasn’t great by any stretch of the imagination, but he was good enough. He went 5 1/3 and despite walking on a tight rope the entire time with command issues, gave us just four hits and two earned runs to earn the win and improve to 5-2. He bounced back tremendously in the fifth inning to record the final two outs after two walks put runners on first and second. He then got the always-dangerous Pedro Alvarez to pop out and induced a ground out of Jose Tabata to end the threat. Miller’s command was so bad at times throughout the game that he missed his location by several feet on a few pitches. I won’t get into him shaking off Yadier Molina because I think it’s a non-issue. The issue was him not feeling confident in any pitches. But Miller took a big step in his maturation process by coming back to get out of that fifth inning jam and inducing a quick pop up the record the first out in the sixth inning. He left the game with what I would assume is a good amount of confidence given how shaky his start had been going. As Daniel Shoptaw writes here, the Cardinals are making a habit of losing leads, and it almost happened again Sunday night. So when Trevor Rosenthal, who loaded the bases with command issues of his own, induced a 1-2-3 game-ending double play, you could see and feel the relief among the players and coaches. It goes back to confidence, which is what this team needs right now. The talent is there. Moreover, there are too many good hitters for this team to keep going cold at the plate and too many good pitchers to keep losing games, and leads, like they have been. The Cardinals now play 19 of their next 22 games at Busch Stadium and have plenty of momentum to build on. It just takes one game like Sunday’s to change things around. Now they’ve got to keep that going and they continue with even more meaningful baseball in the middle of the May.